Key Number four of the Seven Keys - The Ordained Stewardship Institution trusted to administer the Dispensation, I Corinthians 4:1-3. All Seven Keys or guiding principles are common to all dispensations and without all of the seven principles being in a dispensation, it does not change. Breaking down each key or principle will help understand the dispensations, seeing the symmetry of God's plan to save the world, and why the dispensation changed, II Timothy 2:15; 2:2. Identifying the Ordained Institutions of Stewardship and the stewards which make-up the institution, will help clarify the dispensation. Identifying each Stewardship will distinguish the dispensation and its changes. Along with the changing of a dispensation, we learn that there is a change in the Stewardship. Whenever the stewards fails in their Stewardship responsibilities, the people become corrupt and there was a lack in the witness to the world. The saved became like the lost and the lost worsened in their evil. This progressive failure of the stewardship within the dispensation brings the end of a dispensation, and God’s long-suffering and patience come to an end. Ultimately resulting in the irreversible punitive judgment coming forth from God that was caused by these two major aspects of the failure and a lack in the world for a witnesses, and bringing in the permeation of sin within humanity. Bringing a dispensation to an end with a period of transition, seen where the new dispensation begins, the judgment comes to completion and the new dispensation taking full control. The term stewardship is inherent in the Greek word for dispensation. The Stewardship institution of stewards are to be faithful in their responsibilities to carry out and manage the ordained operation of God's dispensational (administration), plan historically, Romans 13:1. The Stewardship is designed by the Sovereign designer, and He designed and established the parameters and responsibilities, Daniel 5:21. There are seven ordained institutions one for each dispensation found in Scripture. There are similarities, differences and commonalities of stewardship throughout the historical dispensations (administrations) with humanity. 1. Dispensation of Innocence, Genesis 1:26-28; 2:25 the Institutional Stewardship was made up of Angles and humanity. Lucifer the guardian cherubim, Adam and Eve are named in Scriptures as stewards of the Dispensation of Innocence, Ezekiel 28:12-15; Isaiah 14:12-15; Genesis 2 - 3. If they had not failed this dispensation, would not have ended, and eternity and life would have continued, Genesis 2:9, 15-18; Genesis 3; Romans 5; Job 31:33; I Corinthians 15:22; I Timothy 2:14. Humanity on an individual relationship would have had access to God directly, walking and having daily fellowship with Him. The Tree of life was there for their taking, but they had refused to eat of it and instead ate of the forbidden tree, called the Tree of Knowledge of Good and Evil. Defying God, they chose to become gods unto themselves rather than trust and obey the only true God of creation and eternity. Today whenever a human rejects the God of creation, they are choosing to become a god unto themselves which leaves them in their condemned sinful nature. 2. In the Dispensation of Conscience, Genesis 3:1-13; Romans 2:12, 15; 5:12 the Institutional Stewardship were the family Heads of stewards. God was dealing with all humanity through the family heads who were ordained priests, and they offered the animals and other sacrifices. The main family leaders or heads mentioned, established this truth seen in Genesis 4-6, where God records only males and their genealogies. There is no priest, king or prophet institution mentioned apart from the male being the head of the family, who were supposed to carry out these functions as ruler of the family. God dealt directly with the males of the families showing responsibility in the leadership role as rulers, the priestly functions, Genesis 4:1-10, 20-24; and the prophet functions, Jude 14 for one's own individual family. (However, if you dated the book of Job to this dispensation offering, a sacrifice for his family it would be correct, Job 1:4-5, but Job may have offered a priestly sacrifice for others outside his direct family, but we do not see this type of relationship until the next dispensation, Job 42:7-9. The record says Job was to pray for them, and his friends did the sacrifice, then these events show family heads carrying out their own responsibility.). Besides the family heads as stewards, angels had a stewardship role that can be seen in their part of the failure connected with the evil behavior between angles and women. Hebrews 1:14 speaks that angles have a stewardship role in the dispensations, having the responsibility to be stewards, and ministering to the children of God. Angel's evil behavior up to the worldwide flood and in conjunction with women's behavior of reproduction permeated the society adding to the evil, Genesis 6: 1-6; Jude 6; II Peter 2:4-5; I Peter 3:18-20. 3. In the Dispensation of Human Government, Genesis 9:4-7 the Institutional Stewardship of stewards was made up of prophets, priests and kings with governmental authority. This is revealed in the rules given to Noah when God spelled out the governing rules for humanity, Genesis 9:1-7, just before He gave the covenant of the rainbow. Humanity now became responsible to judge the offenders and pronounce judgment, Genesis 9:5-6. The stewardship is further revealed as the dispensation matures with the King of Salem who was not only a king, but also, had the qualification as a priest, Genesis 14:18-21. Ruling kings are mentioned many times from chapter 10 through to the end of the book of Genesis. The priest offered animal sacrifices and received tithes in their duties. This priesthood was before the Levitical priesthood in the Dispensation of Promise. Abraham's father-in-law during the transition, was a priest of the old system of the Dispensation of Human Government, Exodus 2:14-17; 3:1; 18:1. (If the book of Job would qualify for this dispensation, then he must have been a priest. Maybe Job offers sacrifices for both his family and his friends, performing priestly functions, Job 1:4-5, Job 42:7-9. It is not revealed in scripture if Job was a king or priest by title, it does not appear, this is why it is hard to place the events exactly in which dispensation. Possible author is Job, (himself), Elihu, Moses or Solomon wrote the book of Job during the Dispensation of Promise. The event could have taken place in the transition from one dispensation to the next, but not enough information is given. Therefore, no matter which dispensation the book of Job belongs, the reason God inspired it for humanity was to show universal principles of faithfulness when things go poorly at times, weather the conflicts come through spiritual principalities Job 1:12-22; 2:1-8, family members, Job 2:9-10 or friends, Job 42:7.). In the transition from the old to the new dispensation, a disobedient prophet Balaam is mentioned, Numbers 22:1-14; II Peter 2:15; Jude 1:1, and a good prophet, Jethro, that was Moses' father-in-law who gave counsel to him as a prophet/priest in whose counsel was wisely incorporated by Moses, Exodus 18:17-23. 4. The Dispensation of Promise, the Nation of Israel were God's chosen people as stewards, proclaiming the creator, the one and only God of eternity, (Promise). The Institutional Stewardship for the world was the Nation of Israel, the physical descendants of Abraham. Abraham's posteriors through Sarah were the ordained stewards who would bless the rest of the world, Genesis 18:18; 17. In exchange or in conjunction with Israel's stewardship the world was to bless God's ordained instrument. It is through the history of this stewardship, the world would receive the birth of the promise seed, Genesis 3:15, Galatians 3:16, Galatians 4:4, Romans 5:1-11. Furthermore, the stewardship was to be the example of godliness, revealing the one true God, this stewardship would reveal many of the moral eternal truths that God wanted humanity to know and obey. Israel's greatness and example was to be a pattern for all believers, to pattern their faith and trust in the one and only God. Through this stewardship God would record the previous dispensational history and bring the Lord of Lords, the Beginning and End to the eternal dispensation, Deuteronomy 10:17, Psalms 136:3, I Timothy 6:13-16, Revelation 17:14, Revelation 1:11, 17; 2:18-19; 22:13. Noteworthy, the prophets, apostles and the writers of the Old and New Testament were written by Jewish men, except Luke, living in the Dispensation of Promise II Peter 1:21, II Peter 3:2. Until the time when the Apostle Paul, who was saved in one dispensation, and became the apostle of the next dispensation, chosen by God to be the Apostle of the full revelation of the mystery dispensation of today, Acts 9:15-18; 22:14; Colossians 1:21-29; Ephesians 3:1-9; Galatians 1:11-12. Prophets, priest and king were to lead the Nation of Israel in holiness, righteousness and justice after being given the Law of Moses. Animal sacrifices were to be practiced by faith coupled with the imputation of God's righteousness (grace) were practiced for the covering of sin until Christ Jesus' finished his work, and the Holy Spirit came permanently to indwell believers on the day of Pentecost that put into effect the beginning of the New Covenant and forgiveness of sin, Romans 4:1-8, Ephesians 1:7; 2. Jesus Christ was to be dispensed through the Nation of Israel's stewardship, Matthew 28:16-20. However, because of the failures of the Nation, the dispensation was overlaid until God finished his plan of a mystery dispensation, reaching the world with the gospel in conjunction, with His judgment on the chosen Nation of Israel, Romans 9;11. When God raptures the mystery believers for His namesake, He will then finish his plan for Israel to be the Nation of his Kingship, Jeremiah 30:24; 32:42; Ezekiel 36:22-37. This world will be responsible to know and follow the chain of command, respecting and obeying God's intention for the Nation of Israel, and His Kingship and Lordship, Ezekiel 39:7, 25. Following the rapture of believers, God picks up where He left off with Israel as a Nation, performing the purging punitive judgment in the Tribulation period, and fulfilling His promises to the remnant left after the purging tribulation. The Nation of Israel will find God fulfilling his promises to them through the Dispensation of the Kingdom, culminating in the Dispensation of the Fullness of Time that will be eternal. Isaiah 60:21; Jeremiah 30:24; 31. 5. Dispensation of Grace is an organism of equality Ephesians 3:1-7. The stewards are all believers with equal responsibility, Galatians 3:28. The Stewardship Institution passed from the Nation of Israel to this new organism of equality from every nation, Acts 7-9; 26; Acts 13:45-47; 28:27-31. This organism is called the Body of Christ where all believers have the responsibility to the ministry of reconciliation, II Corinthians 5:17-21. Privileges and duties of stewardship for the saved is to walk as children of the light, and giving Testimony of the truth of God and His Word, the Bible daily, (Luke 16:10; I Corinthians 4:2; II Corinthians 5:17-21; Ephesians 5:8; I Thessalonians 5:5). This particular dispensation was fully revealed through the writing of the Apostle Paul, who wrote the majority of the New Testament books (Romans through Titus), (all of them are not the longest books, but he is the instrument used by God the Holy Spirit to write most of the books), Galatians 1:11-12, Ephesians 3:1-7. He was given by God, the title of the Apostle to the Gentiles that included all nationalities. He wrote at least 12 of the books and perhaps wrote the book of Hebrews, making the total thirteen. He was commissioned by God to be the Apostle to the Gentiles, and his commission was to all humanity according to the revelation of the new dispensation, he received from God alone, not on someone else's teachings, he was directly taught by Christ Jesus in conjunction with his knowledge of the other prophetic writing given in the former dispensations. 6. The Dispensation of the Kingdom is the Kingship of Christ, here on Earth with all believers saved from all dispensations, participating in the worldwide Kingdom rule, Revelation 17:14;19:11-21:20:1-4. The Nation of Israel will once again be the Stewardship Institution and the nations are to be subordinate to Israel, Matthew 19:26-30, Luke 22:25-30, Luke 1:27-33, Acts 1:3, Romans 11:25-27. The stewardship will be made up with the Jewish believers from the tribulation period, the Jewish remnant prophesied in the old testament, (Zephaniah 3:13-20), and the gentile believers from the tribulation period from all nations who accepted Jesus Christ that refused the mark of the beast, and endured through the seven-year Tribulation period, (some will still be alive who endured by the end of the tribulation), and all those who were martyred will rule with Christ, Matthew 10:22, Revelation 20:4, Revelation 2:7, 11, 17, 26-29. Along with the tribulation saints, the saints from all the other dispensations, (I Thessalonians 4:14-18) who then had been glorified at the Rapture, both old and new testaments believers, will rule with Christ, I Corinthians 6:2-3, II Timothy 2:11-13. Fulfillment to the Nation of Israel will find its completion along with the fulfillment of God's covenant made to David's descendant, Christ (Messiah) in the Millennial reign, who will sit here on earth literally, starting with this dispensation of the kingdom and going into eternity, Isaiah 9:6-7, 2 Samuel 7:1-13, Luke 1:31-32. Christ Jesus' coming to earth is called his second coming, this is literal, Acts 1:1-11, 1 John 2:28, Luke 17:27, Mark 14:62, Matthew 24, I Thessalonians 3:13, I Corinthians 15:23, Malachi 3:2. Transition into this dispensation starts with the seven-year tribulation period ending in the victorious battle called Armageddon, (Revelation 16:16) after the Rapture of the proceeding dispensation and before the full operation of the Dispensation of the Kingdom. The Mystery Rapture (that was not prophesied), and the exact beginning of the seven-years period is not completely know, but the Scriptures make it clear that the tribulation period is after the Rapture with the judgment of the nonbelievers of the Dispensation of Grace going into the tribulation judgment, I Corinthians 2:7; 15:51, I Thessalonians 4:13-18; 5:4-11, II Thessalonians 2:1-17, Romans 11:15; 16:25, Ephesians 5:32. The Dispensation of the Kingdom will be here on this present earth, the New Heaven and Earth will not occur until the end of the 1000 years of this dispensation of the Kingdom, Revelation 20:1-21:1-5. (This can be confusing because the word Kingdom can be applied to the eternal Kingdom of God, the Dispensation of the Fullness of Time, Galatians 5:20-21. In this stewardship Satan will not be an active factor, Revelation 20:1-3. Satan will be locked up by God unable to lead his fallen angels (called devils and demons) and tempt and cause outside rebellion in hearts of humanity. However, the birth of children within this dispensation, those humans born of women will still need to accept and receive Jesus Christ as Lord of their life, Isaiah 65:20-21, Revelation 20:7-10. The hearts will not be influenced by Satan, non-believing humanity will be condemned and cannot say 'that Satan made them do sin,' instead they will be condemned because they rejected God's finished work at the cross on their behalf, Romans 5:7-8, I John 5:9-14. The stewardship within families will break down because by the end of this dispensation there is a great number of those born, who will follow Satan in the battle call Gog and Magog against Christ Jesus, Revelation 20:8-9, Ezekiel 38:2,16, 18-23. 7. Dispensation of the Fullness of Time, Ephesians 1:10 an eternal Kingdom ruled by God along with the redeemed, 2 Kings 19:15, Psalm 45:6, Daniel 2:44, Matthew 6:33, Acts 28:23, Revelation 12:10. The stewards are all the redeemed saints of all dispensations under the authority of the eternal Steward. Some of the characteristics from the previous dispensation are carried into the eternal: The King of Kings is still Lord of Lords, the Alpha and Omega, the beginning and ending, Jesus Christ's throne is eternal, believers reigning with Christ will still be under the chain of command as previously establish, but their orders will be different. The Godhead holds the Institutional Stewardship that will never fail and no new dispensation will ever be needed. This is the last dispensation where sin is no more, and all saints live forever. All fallen Angels along with Satan, and all consciously rejecters of God who rejected His revealed truths are in the Lake of Fire. The New Jerusalem has Christ's throne in it, and the Tree of Life still exists and will come down to the New earth, Revelation 21:5-6. Within Heaven and Earth there will be no division, Revelation 22:1-5. The New Jerusalem is called the Bride of Christ coming down from Heaven, and uniting with the New earth is called the marriage feast of the Lamb, Revelation 21:1-4. Then, Jesus Christ hands everything over to the first person of the trinity and the Godhead, the Elohim of eternity has completely fulfilled His plan, planned in eternity past, I Corinthians 15:28. It may be asked where are the saints who were in their natural bodies when the previous dispensation ended? There is not a clear answer. Perhaps they will receive their redemptive body at the time of the New Heavens and Earth creation, the Word of God does not say specifically. Whatever, we do know, there will not be any sin, so logically somewhere along the line going into this eternal dispensation, they would have received their final redemption. Some may speculate and say it is at the time of the Great White-Throne Judgment, but if it is, it will not be with the condemned, because the declaration of Psalms, chapter one reveals it will not happen along with the condemned. Each Dispensation ends with humanities failure, except the Eternal Dispensation, it has no unredeemed person there. God provides a new dispensation until the last, salvation and hope based on His covenant of redemption is complete. The Dispensation of the Fullness of Time will not end, God has completed His offer of redemption to man. Satan and the non-redeemed along with all evil are eternally gone to the Lake of Fire, Revelation 20:11-15; 21:8, Matthew 13:36-42. The chart shows the instrument of whom God ordained as steward for the historical fulfillment of the dispensation. 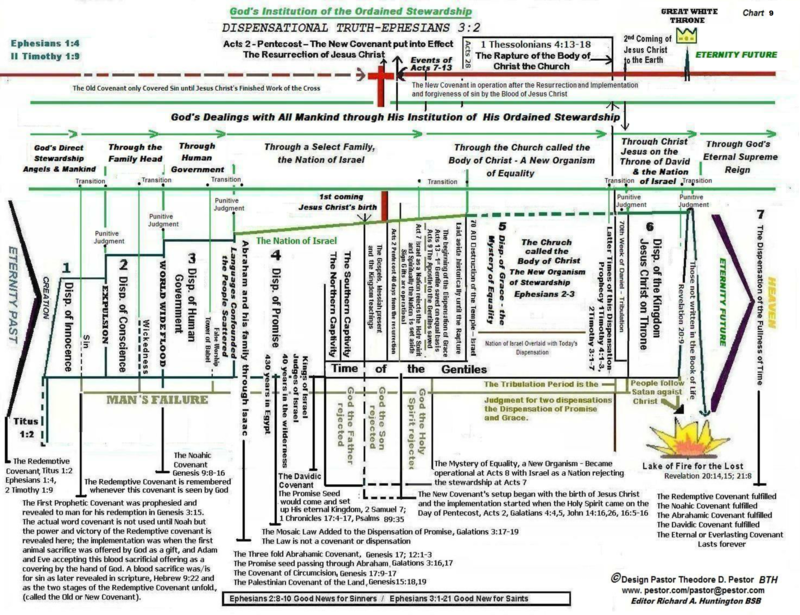 Under the different dispensations, on the chart the title ‘God’s dealings showing how the people of this world were to be reached, and are being reached or will continuously be reached. God ordained each individual institution of the dispensation to reach humanity with the message of His desires, bringing sanctification, and giving a message to the lost that they could be saved if they respond according to God’s provisions that He had ordained.